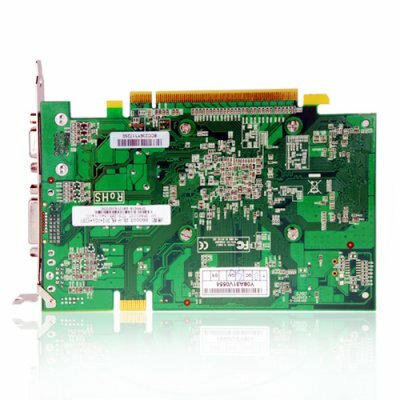 Successfully Added Nvidia GeForce 8600GT 128MB PCI Express x16 Video Card to your Shopping Cart. Video graphics card based on the high performance Nvidia GeForce 8600GT chipset with 128MB of physical memory, using a PCI-E connection. Upgrade your video card with this high performance NVIDIA GeForce V8600GT Dual DVI PCI Express Video Card. With key features such as its dual DVI-I ports, S-Video TV-Out, NVIDIA PureVideo HD technology, and full Microsoft DirectX 10 Shader Model 4.0 support make it an ideal video card for both high-end gaming or home video enjoyment. Super charge your PC's graphics with this high performance NVIDIA GeForce V8600GT PCI Express Video Card! All of the key features of modern PC games are supported including HDR with FSAA, 64-Bit Texture Filtering and Blending and full DirectX 10 support. Incredible graphical power at your fingertips await you. This card is perfect for games where 3D graphics feature prominently such as intense first person shooters and strategy games. Stay competitive in online gaming with high screen resolutions and high frame rates. Enhance your experience - see and feel games in the way they were meant to be! If you enjoy computer gaming, then reward yourself in 2009 by upgrading your system with a new high performance video card - available at a budget friendly price. This NVIDIA GeForce 8 Series graphics card also supports HDMI with audio integration solution, giving you a richer, fuller experience with multimedia applications. The card would also be ideal for the Windows Vista operating system ensuring you access to all of the graphic features such as Windows Aero. This is a great product at a direct to you wholesale price makes this perfect either for the resale market, or personal/company use. As always, it is available right now from your source for wholesale direct from China electronic products, Chinavasion. NVIDIA GeForce 8600GT chipset 128 MB DDR3 memory PCI Express x16 interface.